Whether you are the actual person doing the editing or on the team involved in the review process for your video, a basic understanding of editing is crucial. Video editing may seem daunting or unfamiliar for many. But really it’s quite simple in it’s purpose and goal. 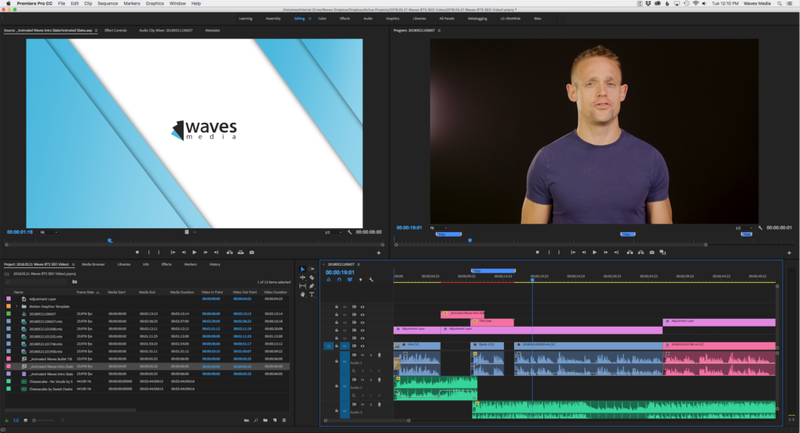 Our team at Waves Media today gives a snapshot as to some important keys to getting the most out of the process. Dictionary.com states that to edit is “to expunge, eliminate”. I love that. Editing in its purest form is really to cut down. Though it is more than that, if you work on just one thing in editing, it would be to shorten, tighten, to delete what can be deleted. The best editors know when to add for sure, but more often they are cutting. This could even be just a frame or two or whole segments and sections that do nothing for the video story. Don’t be afraid to cut it! Putting things in the right order or ‘sequence’ is a huge part of story-telling. The most basic outline of a story is the (1) Beginning/Opener/Setting the Stage, the (2) Development/Problem, and the (3) Ending/Solution. Putting sub-messages in the right place within the greater message of your video is difficult. So here are a few ideas to help. Map out the ideas/topics on a chart or document. Graph them out. I love apps like mind node for this. Move them around and see what works. Do the same thing but within your editor (whether Adobe Premiere, Final Cut, whatever). Color coding sections for easy-viewing can help in this. Bring music in to help you ‘feel’ the opening, developing middle, and closing. Delete any repetitive clips that are not moving the story forward. Soon you will have less clips in front of you and it will be even easier to sequence. Once you have a first draft in front of you, it’s time to ask the initial question again. What is the message we are attempting to communicate. Is this edit relating that, or better yet, improving it? Our advice is to usually start small with the circle of people/input you are receiving on the first cut. It will be more productive when you share with everyone involved if you do that first. Once you make some changes based on the initial smaller group’s feedback, it will be ready for more input. This will save on time, confusion, and effectiveness. And if you are the editor: as best as you can, don’t take feedback personally. Stay objective and listen. The best editors, directors, filmmakers, and creatives should know how to value their work all while seeing the potential for it to be better. And ‘better’ can often come from feedback.